This tutorial is inspired by this cool demo. The code is simplified and recorded as a walkthrough covering basic concepts like drawing and animating text on canvas. This version uses a different character set(Japanese+Engish+Numbers) taken from the original matrix animation. What is the license of the code? Very nice to mess with and try to make a representation of binary code! I thought this was cool to add to my site for a school project, but for me there are only numbers and punctuation. I tried setting the charset to UTF-8, but it didnt work. Help? Can Someone explain how the letters are to become more transparent as the loop continues to do its thing? I didn’t know this is possible with HTML5 canvas. i like what you write about matrix, its amazing JS. Can’t get this to work anywhere. Wrote it from scratch based on the tutorial didn’t work, copy and pasted everything still didn’t work. Total noob here. Can someone explain how to link the docs/get this running on a local system after writing the code presented here? I am just starting out to learn Java. I was wondering if there was a way to get this to put certain letters in the waterfall and then stop together and spell a name or say something specific? I want to put a specific text and not have my letters random all over the screen .. It worked on me, but I’m still having a hard time tweaking it for transparency! 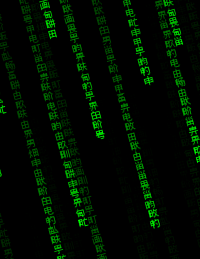 I hope I can use the matrix as a background overlay for my website soon.